The schedule may be updated until the day of event. Children of a Nuclear Playgrnd. if you are walking to Spirit Temple at night. if you are walking to Outback City at night. Band Collaborations, Open Jams, Spontaneous Acts of Kindness, Performance Art, New Recordings inspired by the landscape and the perceptual sculptures on the grounds. audience dancing in the sand. WaterSight is a place for DREAMING MEDITATION. Four concrete tubs arranged in a four directional layout for the audience to listen while soaking in the hot/spring water. Music performed by the tubs is timeless to enhance audience dreaming. far reaches. A small space with limited seating and setup area. Think 1950's Caboose on tracks. Available for ACOUSTIC experiments with any and all sound devices. 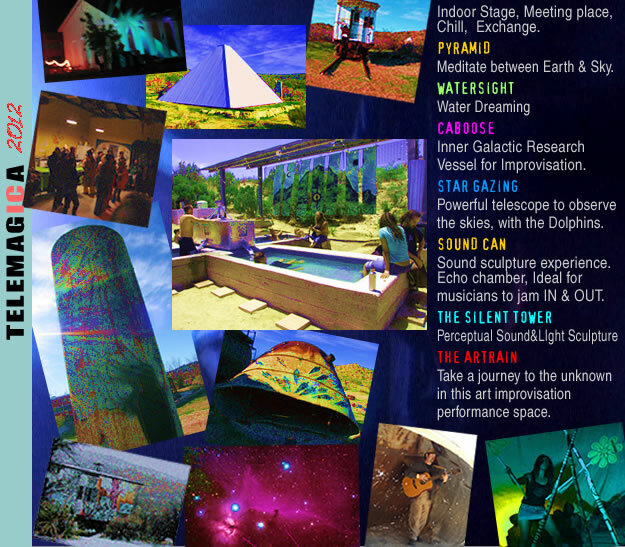 We encourage silence from the audience, using the Pyramid as an intimate spaceship flying to the Belt of Orion. Echo Chambers for musicians who like Natural Reverb! Explore the RIDGE TRIBE at Outback City. On top of the Ridge a new world of Electronica soundz awaits you. and creating a vehicle for artistic evolution.